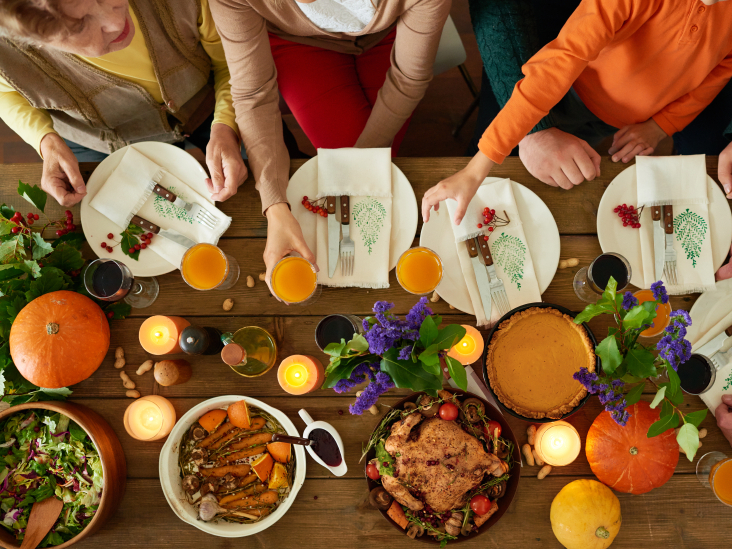 Being Thankful In The Wake Of Tragedy : 13.7: Cosmos And Culture Beyond gratitude for the narrow compass of our own lives, we can take a step back to be thankful for the broader circumstances that make those lives possible this Thanksgiving, says Tania Lombrozo. On Thursday, families across America will participate in a yearly ritual around the Thanksgiving table: expressing their gratitude. Some will be grateful for friends and family, others for health or material well-being, for safety, the natural world or the meal before them. But what does gratitude look like in 2015, with Thanksgiving coming on the heels of significant loss of life in terrorist attacks in Beirut, Paris and beyond? With Syrian families fleeing a bloody civil war? With international news that's anything but reassuring? On the one hand, these are powerful reminders of all we have to be grateful for. Many of us take safety and stability for granted; we don't worry about where our next meal will come from or whether our families can remain intact. On the other hand, it might seem selfish or small-minded to focus on our own individual blessings, insignificant as each of us is in the face of so much suffering. Does any good come from our gratitude? The answer is probably yes: Gratitude can increase empathy and support personal well-being. But it also matters what we're grateful for, and tragic events might push us to experience gratitude with a wider perspective. After the terrorist attacks of Sept. 11, 2001, many Americans reported a shift in their values and priorities. For instance, one study found that people identified their character strengths differently in the two months following the attack than in the months immediately prior. They judged themselves to more strongly possess characteristics that reflected hope, kindness, love, spirituality, leadership, teamwork and gratitude. Another study analyzed Thanksgiving essays written by more than 300 school-age kids living in the Midwest in 2000 and 2001, straddling each side of the Sept. 11 attacks. Children were most often grateful for their families and friends, for having their basic needs met, and for their teachers and schools. A 9-year-old girl wrote: "I am thankful for my mom and dad because they help me with my homework." Yet, there were also significant differences between 2000 and 2001. After the terrorist attacks, children were significantly more likely to write essays expressing gratitude for living in the United States, for American values (such as freedom), for police, firefighters and other helpers, and for other people — those who were neither family, friends nor teachers. One 6-year-old wrote: "I am thankful for policemen. They help people." There was also a trend where children mentioned gratitude for material objects less often after Sept. 11: In 2000, 13.8 percent of essays included a statement of gratitude for material objects; in 2001, only 8.2 percent did. Will we see similar effects in the wake of this month's tragedies, with shifts in priorities and changing targets of gratitude? As we learn to cope and move forward, the Thanksgiving holiday offers an opportunity for reflection. Beyond gratitude for the narrow compass of our own lives, we can take a step back to be thankful for the broader circumstances that make those lives possible — circumstances that relatively few people share.